January | 2012 | "clever, well-informed people"
I’ve talked about having watched Gone with the Wind for the first time. And now I’ve finally watched the John Ford Grapes of Wrath, which I’ve owned for ages and ages. So good. 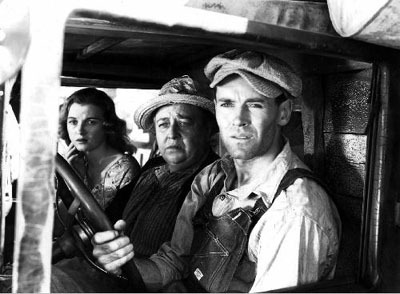 The acting is terrific, especially Henry Fonda, who is as close to the perfect Tom Joad as any one not in one’s own imagination. At the opening I found John Carradine as Jim Casy a bit phony, but that evened out over the course of the film. It is a radically different story than the novel, due to the removal of the last scene and the more traditionally optimistic (since I believe the novel’s ending is one of hope) conclusion. That’s fine with me, although disappointing. I realize the novel’s ending is difficult and not necessarily well-suited for film. But the movie also leaves out some parts that, while less significant individually, could have a great deal of influence over the rest of the story. I love the turtle at the opening of the novel: crossing the road and getting flipped over, but continuing on (at least till Tom comes by to pick him up for Winfield). It might be heavy-handed as a metaphor for the family, but I think it’s effective. I don’t understand why so many productions seem to leave out the Wilsons, the couple the family encounters at the beginning of their journey. The Joads have to stop for Grandpa’s death anyway, and the scenes with the Wilsons show how ordinary people could count on each other, a theme to be both contradicted and repeated throughout the story. Other changes lead, I feel, to the family being treated more as a symbol than as individualized characters, and these changes also detract from the effectiveness of Jim Casy’s overarching messages of humanity’s one spirit and the problematic nature of sin and morality. The film ignores Noah’s difficulties and his leaving, as well as Pa Joad’s guilt at Noah’s condition. Uncle John’s guilt over the death of his wife and its impact on his feelings for others, especially children, is also not shown, and its lack makes some of the scenes that are included in the film (the hungry children at the camp) less effective. I did love it, and am happy to have finally seen it. But it makes me wonder what surprises I’m in for when I finally read Gone with the Wind. That at certain times of year, there are certain kinds of snow that farmers plow into their fields. K was surprised, and I could be superior in my knowledge thanks to Laura Ingalls Wilder and Farmer Boy. *Just kidding. I haven’t actually been counting, and it would be way higher than that.